For the last few years, the number of mobile users has grown rapidly all over the world. And all these users find online shopping via an e-commerce app much easier and convenient way to shop. 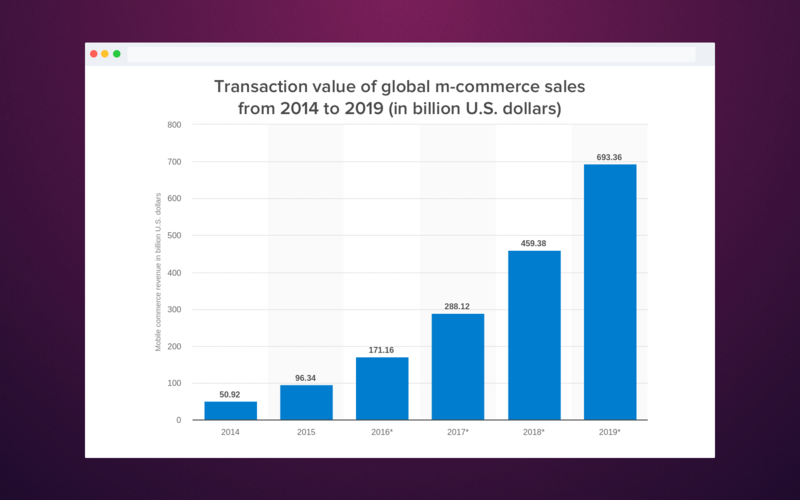 According to Statista, the transaction value of global m-commerce is going to reach $460 billion in 2018 and almost 700 billion in 2019. 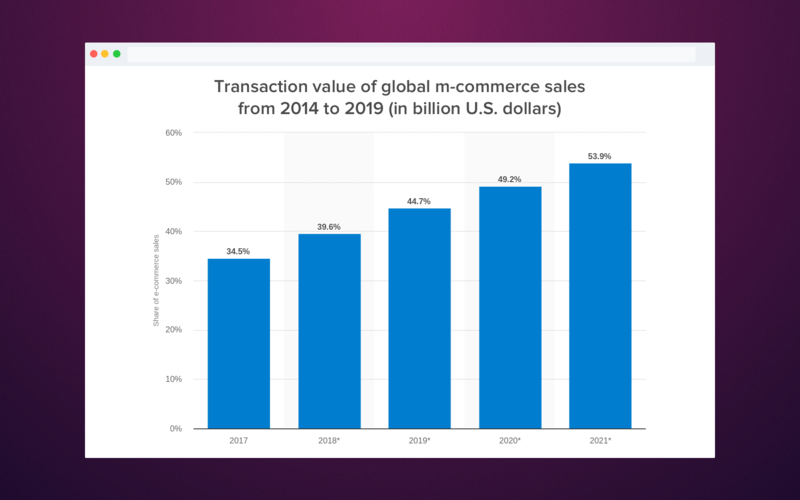 Moreover, the same source predicts a rise of mobile retail commerce sales compared to all e-commerce sphere from 35 to almost 40% in 2018 and claims that in 2021 m-commerce will take more than 50% of all e-commerce transactions. It is clear that the mobile devices are going to leave computers behind when it comes to the best device for daily routine. The most important reason for such a phenomenon is that we carry mobile phones with us all the time and can surf the net whenever we want or need. The majority of mobile apps are much faster than the websites. The average time needed to perform one action is much lower than on a website. Besides, there are no ad banners or pop-ups which annoy customer so much. An app usually offers a really short way to a purchase. Such elements as 'one-click ordering' makes the whole process faster. There is no need to roam a site looking for a needed option. People also love mobile apps because of the features which are absent on a site. Such utilities as GPS, camera, finger or face scanner attract users with new possibilities. For instance, GPS mode can show a user where the nearest shops are, a camera can empower Augmented Reality feature, which allows users to 'try a piece of closing on' or see how some furniture would look like in a particular place. The face recognition or finger scanner give a customer an opportunity to pay for products or services in a matter of seconds. All the features we've mentioned above increase users' acquisition and engagement. With the help of push-notifications, you can inform a customer about new bonuses or discounts and increase your conversion as a result. The same feature helps keep in touch with a client and builds trust between a brand and a customer. 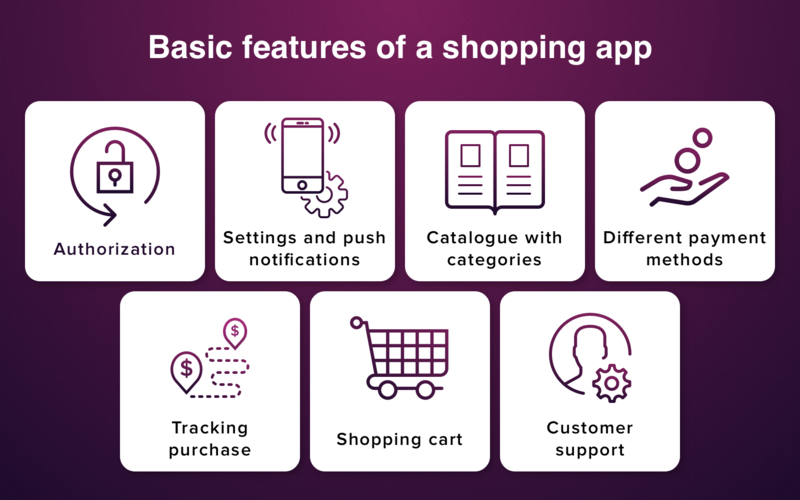 An ability to pay faster and easier and a lot of additional features (compared to a site) all this makes shopping apps a great opportunity to boost your retail business. There are two ways to create e-commerce mobile app. The first option is to hire a development team and build one from scratch and the second option is to use one of the mobile app builders. All the pluses and minuses of automatic app builders you can find in our previous research. Still, we highly recommend you to choose a development company if you want your app to work seamlessly. 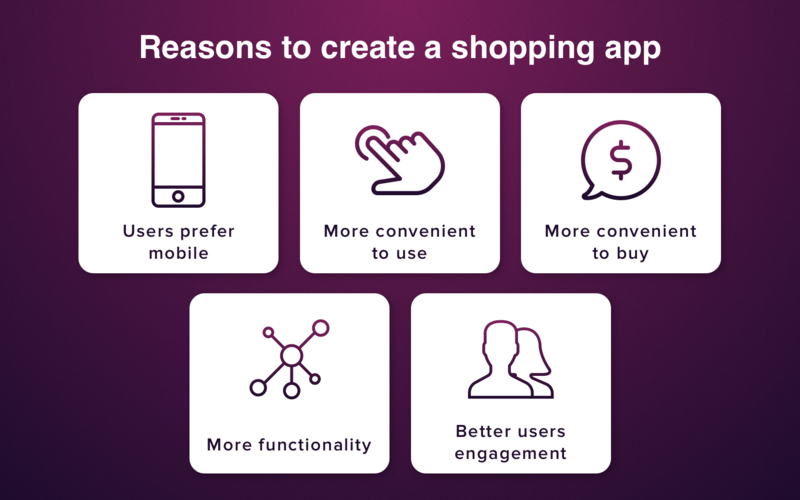 But let's get back to the point before you get to the development stage of your own shopping app, you have to plan and know exactly what functionality you need in your mobile commerce application. Let's start with the set of features which forms a minimum viable product. Below, you'll find a set of functionality needed for an e-commerce mobile app development. These features are necessary for a minimum viable product, it means that without any of these features your app would fail. Authorization is usually implemented by means of direct interaction via the client-server API. If you want to enable the opportunity to log under the existed account (e.g., social media), you can do it with the help of the open authorization protocol, like oAuth. Thus, your app will not remember the third party credentials but still will be able to create an account. They are adjusted by means of client-server API. For push notifications, you will have to deploy special push notification servers different for each operating system. If you want to create an IOS app and an app for Android platform, refer to the APN (Apple Push Notification) and GCM (Google Cloud Messaging) servers respectively. It starts with defining the essence of 'goods'. Item of goods is something unique in the system which has ID, title, price, details, etc. You will have to maintain the data records as for the goods available in the warehouse. Additionally, you will have to define the essence of 'category'. It may consist of category ID, parent category ID (where the category will be considered as a sub-category, like Wheel is a sub-category of Spare Parts which, in its turn, may be included in the Car category). Many-to-many relationship between products and categories should be organized. It means that one category may include 0 and more products. In its turn, one product may be placed into 0 and more categories. The user should be able to limit the search results by one category (either firstly select the category and then start searching products within it or select a product and see all the categories it is placed to). Defining the product category can be done via the admin panel created by the development team. Various payment methods are integrated with the help of the processing centres of the companies you are going to work with. The most popular ways to submit payment are via payment card, PayPal, direct bank transfer, cash on delivery, etc. Tracking purchase enables users to see the status of the order. You should also implement a feature to cancel it at the initial stage. It is important to let users see how fast the order is processed. Integrated SMS functionality allows you to inform when the order is sent, processed, delivered, etc. Use existed services like Twilio, Clickatell, Plivo. They have already developed the mechanism of sending messages. You should only integrate it into your app by means of their API. A shopping cart is an essential option for all e-commerce applications. Surfing your app users will add the products by clicking an appropriate button. Customer support can be organized via email, online chat, or both. You can also leave a phone number for customers to call. For integrating email and chat support, you can use special services. Thus, you don't have to implement the chat on your own, but simply integrate ready mechanisms into your app. The modern solution is a chatbot, which works better than people but will cost you less. In our previous article, you can find all the benefits of Chatbots for your business and how to implement one. This basic functionality is great for the start. Still, if you want your app to outshine all the rest, you need to make it unique and add more useful features.